True story: As a child, if my taco fell apart mid-meal, I would start crying. In case you hadn't pieced it together by now, I was a fat child. 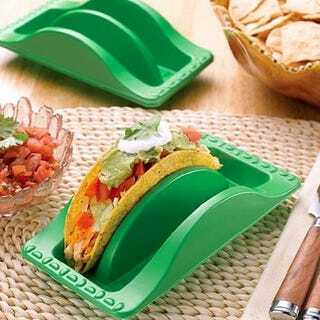 If only I'd had this set of taco plates then (just $8 for 6! ), I could have made a serious run for juvenile diabetes. Instead, I'm sitting here with a slightly high but reasonable BMI, repressing my crushed dreams/tacos with Freudian levels of emotional aloofness.